The cypress tree family is widespread, containing over 130 species. Through DNA analysis, it has recently been determined that both the juniper and giant sequoia trees are related to the cypress family. However, when someone mentions the cypress tree, they are generally speaking of one of three main species – the Bald Cypress, the Leyland Cypress, or the Arizona Cypress. These are the most popular and widely used cypress trees in America, and each has unique characteristics. You can be sure one of these species will fit your landscaping needs. 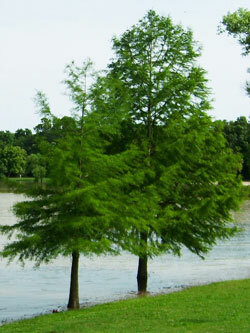 The Bald Cypress is the symbolic tree of the southern swamp; however, it is quite adaptable and has been grown successfully much further north. It is a large tree, can grow as tall as 70′ and spread as wide as 25′ at the bottom. It tolerates all soil types, is adaptable to wet or dry conditions and can withstand flooding. The Bald Cypress is a deciduous conifer so it will not only produce cones, but will shed its needle shaped leaves in the winter. It has a uniform conical shape. The Leyland Cypress is a fast growing evergreen and is very popular in landscaping. It is a large tree, can grow as tall as 60-70′, with a smaller spread of about 15-20′ at the base. It also grows in all soils, prefers full sun, and requires an average amount of rainfall. Unlike the Bald Cypress, this tree retains its blue-green needles throughout the winter. In maturity, the Leyland forms a columnar or slightly pyramidal shape and its dense branches make it a prime choice for forming windbreaks or privacy hedges. Although the Leyland Cypress prefers full sun, it does not adapt well to hot climates and becomes susceptible to a fungus known as Cypress Canker. Both the Bald Cypress and the Arizona Cypress perform better in the extreme southern states. The Arizona Cypress is the southern belle of the cypress species and does not grow well in the middle or northern states. It is smaller and wider than the other species, growing to about 45′ with a spread of 25-30′. The Arizona prefers full sun, grows in all soil types, and has normal moisture requirements, but has good drought tolerance. Due to its dense branches, gray-green needles, and uniform shape, it is widely grown for Christmas trees. It is also widely used in landscaping as a focal point or anchor. These three varieties of cypress trees cover all the bases. Wet or dry soil, hot or temperate conditions – there is a cypress tree to meet your needs. Choose the melancholy Bald Cypress, the slender Leyland Cypress, or the elegant Arizona Cypress. Each and any one will add impact to your landscape. This entry was posted in Reference and Education on November 22, 2013 by admin_z.